Because Trump curtsies to no one! The problem is whether any moles exist in the WH, if it’s all about the money, since in a Trumpian world, loyalty is difficult to buy over dinner. 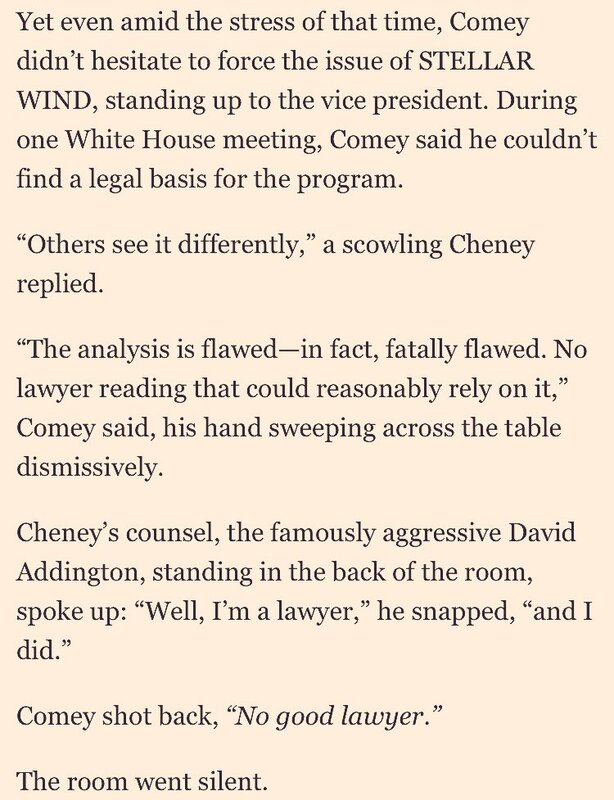 In Trumpland, Comey just hadn’t got enough of the vigorish. Everyone has their price. After all, Vlad Putin is going to get a big payday when those Crimea sanctions get lifted. It even may be too late to get The Donald’s name onto the Nobel Peace Prize shortlist. If Dylan gets the Literature Prize, who can deny the golfer-in-chief. President Donald Trump‘s first trip abroad will be to the volatile Middle East, so security will be paramount for the commander in chief. On his second stop, Israel, the president will be staying overnight in one of the safest places on earth – a bomb-proof, bullet-proof, poison gas-proof $5,700-a-night hotel suite that can withstand a rocket-propelled grenade or even a building collapse, NBC News reported on Friday. No one should believe anything the National Enquirer writes. The fact that the National Enquirer says Flynn is a Russian spy likely means Flynn isn’t a Russian spy. But this story matters because the man who runs the National Enquirer, David Pecker, is a huge longtime friend of Trump. The Enquirer only runs stories that help Trump. And there is no way the Enquirer would run this story unless Team Trump thought this story helped Trump. So the real question is why the White House thinks it’s to Trump’s advantage to suddenly throw Flynn under the bus… And finally, the “best” spin the White House could come up with is that a Russian mole got inside the White House. What’s the worse spin? What possible story could the White House be trying to hide, protect if they’re using the claim “Trump hired a Russian spy in the White House” as cover? This entry was posted in 2016 Election, Celebrity, Government Propaganda, History, Israel, Jurisprudence, Justice, Media, Political Science, Politics, Presidents, Propaganda, Russia, Saudi Arabia, Society, United States, War on "Terror" and tagged Conspiracy Theories, Donald Trump, Media, Michael Flynn, Politics, Russia, trumprussia, White House. Bookmark the permalink. McMaster is between a rock and a hard place. If he tells 45* not to say something, that guarantees it will be the first thing out of his mouth…or in a tweet. I am convinced that has something to do with the famous short attention span. The only thing he seems to remember is the last thing said to him, and not even that for very long. I believe that may be why we see him contradict his press people so much. They say something did or did not happen, it somehow lodges in his head, and he blurts it out to the first person who asks a question. Makes the spokesperson look like a liar, a fool, or both. I would like to have the Xanax franchise for the West Wing. Offered with no further comment. I read the report on how easy it is to hack Mar-A-Lago and it is obvious that there is no security in place. I also read that staff use the non-secure wireless network for routine tasks. Nice. If no password other than an unchecked room number is all that is needed to get into the network, odds are that it is crawling with bugs that phone home with whatever is moving through the system. The report said you can log in from the highway in front of the gate of from about 800 feet off shore. There is a TED talk by an IT professional and hacker. He says that when he checks into a hotel, he does not see the same thing average people do. Where others see a television, he sees a node. Using that, he can look at every TV in the place, find cameras, telephones and any computers that might be plugged into the system. I am guessing he has the skill set to get into the hotel register and find out who checked into every room. I suspect he can duplicate room door lock cards as well. All from the television in his room. He can probably charge his room to your account as well. When the guys at IBM designed the PC they did something unusual – They put an addressable connection in every I/O port that can be used to send or receive data. Your software program sets it as an input or output. Who would ever think that a monitor is anything but a device that takes information into itself and displays it on a screen? Ever heard of a touch screen? every phone has one today. How about a keyboard that not only send codes to the processor when a key is pressed, but also has a memory chip reader and writer in it. Today, all devices are two way communication machines. Samsung’s “SmartTV” listens for aural commands to change channels or adjust volume that also phones home through its wireless connection to tell mom what you are watching and how nice you are when you ask to see it., along with anything else you say. There is no electronic device that is immune from a skilled hacker. I have a camera on top of my monitor for Skype. It stays unplugged, as does my headset with microphone. An air gap is the ONLY way a hacker can be blocked. To a normal person calling Flynn a Russian mole would not look good for the W H. To the Brietbart crowd this fits right into their narrative. That Flynn is an Obama man, that it was Obama that gave Flynn his security clearance, it’s all Obama’s fault. That Pres. Obama also fired Flynn is conveniently forgotten. Now the great, powerful and forgiving trump is trying to give Flynn another chance. Note: I try to keep up with several right wing, pro-trump sites. Trying to keep up with their circular “logic” gives me a headache so I can’t read much at one time. It is amazing sometimes to see how much irrational hate they pack into just a few all capped sentences. I too try to stay current on both sides of the coin. One observation that I have is that there are plenty of pro R sites that rant and rave about how unfair everything is in regards to their fearless leader, spewing hate, conspiracy and discontent. On the pro D side, they are hard at work thanking each other, correcting grammar and spelling errors and spewing hate, conspiracy and discontent.